Fresh eyes on London: Super Purple? Super Purple doesn't sound right does it? Not sure what his name is. He was promoting a new gym in the area. He disappeared as quickly as he arrived. I think not because of supernatural powers but more to do with how silly he felt. 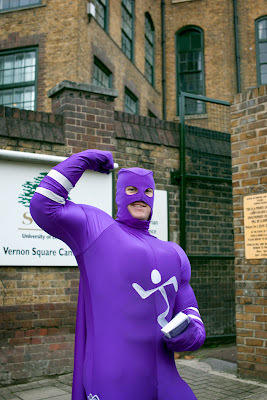 He seems to be in good shape unless his purple suit was padded! Ha! What a costume! Yeah, I would want to disappear too if I had to wear that costume! It looks fun! I like superheros. He does look 'fit' under that silly purple suit Mo! Lucky you caught him before he dashed of to hide haha! Anybody remember Donny Osmond's "Captain Elurpe". This guy looks like the 21st century version.